Havana, December 29th, 1955. At the end of a meal offered to his "loyal" henchmen, Don Alessandro mentions current "affairs" when suddenly the phone in the restaurant's back room rings out. The Godfather is summoned to president Batista's office. He hands his precious cigar box to his minions. 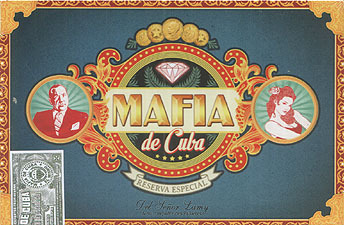 We must admit that it has a fake bottom: under the first row of cigars is a stash filled with diamonds! remain a Loyal and "honest" gangster, be a Driver, a Cleaner, or even an undercover FBI Agent (by grabbing an appropriate token). Once night arrives, the Godfather recovers his box which passed from henchman to henchman. He chokes with rage and investigates the disappearance of the diamonds. He must recover his treasure without failing to punish the culprits and offer them cement shoes before throwing them into the bay. After vicious debates and perilous deductions, will the Godfather recover all of his diamonds with the help of his Loyal followers? Will he lose his honour by wrongful accusations? Will the wiliest of Thieves claim victory? Or will the FBI send all of this scum behind bars?